Fits 1998-17 Harley Davidson Big Twins (except 2013-19 narrow primary models). Low profile lock-up billet pressure plate. Specifically designed to fit under the stock primary/derby cover. Increases the capacity of the stock clutch while keeping lever effort to a minimum. 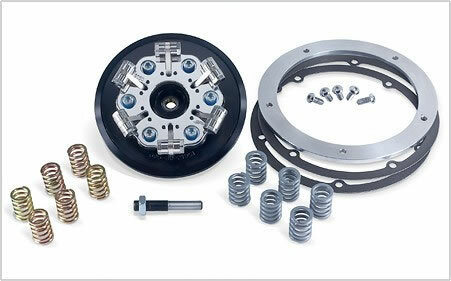 Six coil springs replace the stock diaphragm spring for a smoother, more progressive clutch engagement. Ideal for stock to big inch motors! Bolt-on installation with no modifications required. Includes billet lock-up pressure plate, three sets of six coil springs (light, medium and heavy). Also included is a spacer for 1998-06 models or if needed to fit with an aftermarket primary cover.